How many bombs has Britain dropped in 2017? The UK has been bombing so-called Islamic State targets in Iraq since 2014 and in Syria since the year after. The Ministry of Defence (MoD) does not release statistics on the number of bombs dropped, but does release weekly updates of operations in the region. BBC analysis shows UK forces have dropped bombs on 69 of the 99 days of 2017 to 9 April. In that time, at least 216 bombs and missiles have been dropped by the Royal Air Force. The total number is likely to be higher as MoD updates sometimes do not specify the number of bombs or missiles used in a strike. Where the number was not known, the BBC presumed one bomb was dropped. The most commonly used weapon is the Paveway IV precision guided bomb. At least 129 have been used against IS targets by the RAF this year. Through Operation Shader, the RAF is supporting Iraqi ground forces as part of a US-led international coalition. The current focus of the battle against IS, which the MoD calls Daesh, has been for control of Mosul. It has been held by IS militants since 2014 and is the jihadist group's last major urban stronghold in Iraq. An MoD update from 6 April details a strike against a "Daesh motor team" in north-western Mosul, where a Brimstone missile was used to destroy the target. The RAF flight then tracked a truck "carrying a terrorist team who had been planting booby traps" before scoring another "direct hit" on the moving vehicle. Meanwhile in Syria, RAF Typhoons have been supporting the Syrian Democratic Forces. 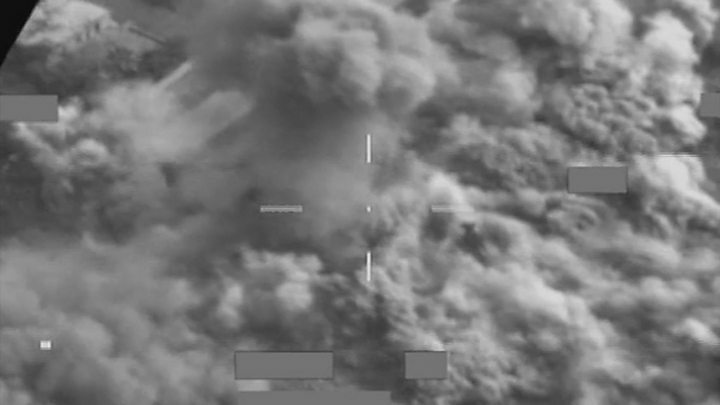 The Ministry of Defence published footage on 18 March of RAF Tornados destroying a building in Syria. At the time, the MoD said: "A Daesh headquarters was identified at a small building five miles east of Raqqa, this was destroyed by a direct hit from a Paveway IV released by a Tornado flight." This strike came shortly after the US sent 400 Marines to Syria to support allied local forces in their assault on the IS stronghold of Raqqa. Exact numbers of casualties from the conflict with IS are not available. 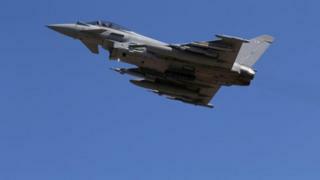 The RAF says it takes all steps to minimise civilian casualties. The UK parliament backed British participation in air strikes against IS in Iraq back in September 2014. Just over a year later in 2015, MPs authorised air strikes against IS in Syria. The UK has conducted more than 1,200 airstrikes in Iraq and Syria since it became involved - more than any other coalition country bar the United States. In 2016 alone, the US dropped 12,192 bombs in Syria and 12,095 in Iraq, according to the American think tank Council on Foreign Relations. The UK is part of the Global Coalition, a body of 68 partners from across Europe, the Middle East, Asia, Africa and the Americas which has committed to defeating IS using military action among other tactics. Mother of all bombs: How powerful is US mega-weapon?